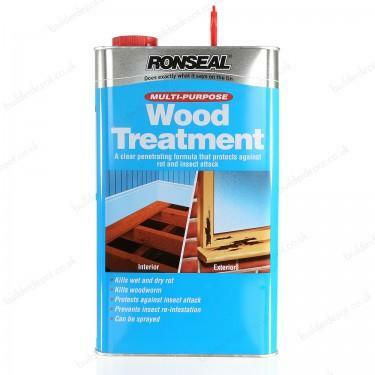 Ronseal Multi Purpose Wood Treatment has been specially formulated to prevent and eradicate wet and dry rot fungal attack of woodwork and joinery items, as well as attack by wood boring insects, such as woodworm (common furniture beetle) and other beetles. Ronseal Multi Purpose Wood Treatment is also effective against the eggs and larvae of beetles and therefore will provide long lasting protection against future attack. Ronseal Multi Purpose Wood Treatment is available as a clear, low viscosity liquid for application to untreated timbers, joinery items, etc. Where necessary these may be finished by over painting, staining or varnishing.